On this page you can find out how to install RivEX for the first time or how to upgrade an existing copy. The folder structure created when you zip RivEX is described here. 1.RivEX is very simple to install. You will be sent a compressed file (zip file) via email. 2.Unzip this file to the root system folder, this is typically your C:\ drive in Windows. This will create a folder called C:\RivEX which will contain several sub-folders. 4.Go to the menu option Customize > Add-In Manager. 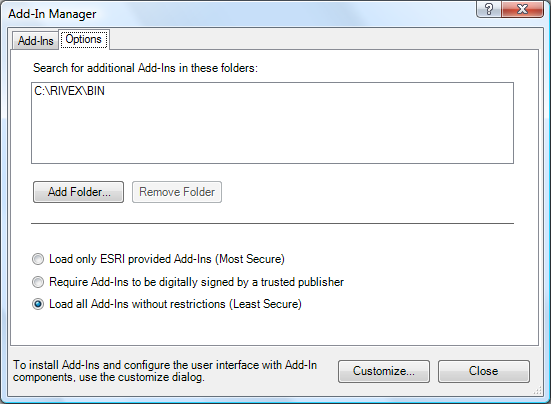 5.Click on the Options tab then using the Add folder button add the folder C:\RivEX\Bin as shown below. You may have other folders referenced here already. 6.Click on Close button. That is it you just installed RivEX! 7.If it does not display the tool bar immediately then go to Customize > Tool bars and tick on the RivEX tool bar. Install RivEX only on the C:\ drive such that it is C:\RivEX.. Do not install RivEX to any other location (for example C:\Program Files\RivEX...) as RivEX will search for this path as this is where your license file is stored. 1.From time to time an upgrade or patched copy of RivEX will be released. You will be contacted with the email address you supplied when you purchased the tool and given instructions of where to obtain the latest version. 2.Simply download the latest version and overwrite your existing copy of the Add-In file. This file is located here C:\RivEX\Bin\RivEX.esriAddIn. You may need to overwrite the Help too if this has changed. The license file does not change.